The angry mobs in Beijing weren’t lying. 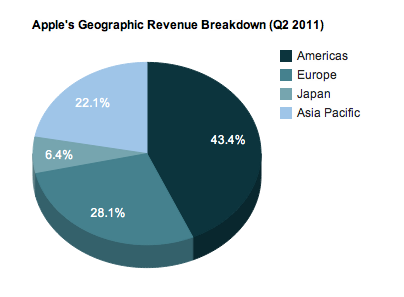 Apple’s iPhone 4 has made a splash in China, bringing the company’s phone sales there up by fivefold from a year ago. The device didn’t debut there until this last quarter, months after it had been released in the U.S.
Revenue in China reached a record $7.9 billion, which is up threefold year-over-year. 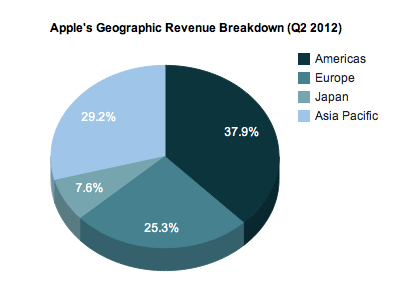 That brings Apple’s revenues in the country to $12.4 billion for the first half of the fiscal year. That’s nearly what Apple made in all of the last fiscal year when it made $13.3 billion in China. “It is mind-boggling that we can do this well,” said Apple chief executive Tim Cook on the earnings call. Cook has already said in previous calls that China is the company’s second biggest market in terms of revenue behind the U.S. Now the market’s rising importance means that Asia-Pacific revenue has surpassed European revenue for the first time. Demand was so insatiable for the iPhone 4 that the company had to shut down sales in retail stores amid the threat of rioting at the Sanlitun shopping center on the east side of Beijing. But Apple still faces some headwinds there. It’s not on the country’s largest carrier China Mobile and the company is embroiled in a trademark dispute over the name ‘iPad’ with Proview, meaning it hasn’t been able to sell the new iPad there.